G.R.A.C.E. 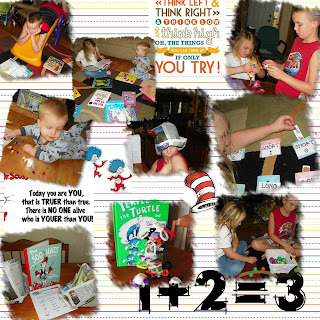 - God's Riches at Christ's Expense: Tales of a Homeschool Nothing ~ I know, up on top you are seeing great sights, but down here at the bottom we, too, should have rights. Tales of a Homeschool Nothing ~ I know, up on top you are seeing great sights, but down here at the bottom we, too, should have rights. I just LOVE Dr. Seuss! He was a very smart man who wasn't afraid to laugh at himself or at others when the need arose. He also realized that children are the future & treated them with the respect they deserve. We celebrated his birthday on Friday. As usual, we went all out. I'm not sure who enjoys this more - me or the kids. We started the day with Yertle the Turtle Cakes & Grinch Punch. We stacked our pancakes as high as we could before they toppled over. I even let them decorate them with green & blue food coloring. This resulted in the need to rebrush some teeth! After reading Yertle the Turtle, we compared king Yertle to a few other power hungry dictators from history. Austin was quick to realize that he sounded a lot like Hitler. (It helped that we are on the brink of WWII so its fresh in his mind). I have always thought that Yertle was a dead on impersonation of Satan and his quest to be better than God. Then we made little turtles out of egg cartons. 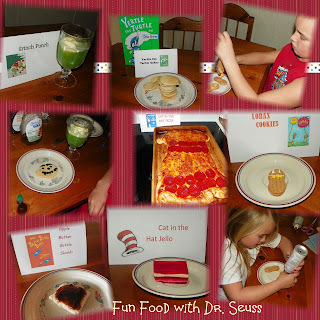 For lunch, we had Cat in the Hat Pizza. It was devoured in no time. I chose a few books this year that I have never read before (or at least, I don't remember reading them) as well as a few old favorites. We created new fish that we might someday find while fishing. We thought up strange teachers and designed their classrooms. We made our own feathered hats. I was also able to incorporate math, word searches, cross word puzzles, logical thinking, character training, and history. We compared The Butter Battle Book with how easily fights can start over the silliest things and escalate into war. This book is great for helping us understand that its ok for someone to be different than us. Then we munched on Apple Butter Battle Shields. We also enjoyed Lorax cookies and Cat in the Hat Jello throughout the day. I stayed up late Thursday night working on a rhyming game with Easter eggs and a pocket game that I found HERE. I just fell in love with it, but I found little lapbook pockets that I used instead of the blue construction paper. I'm sure they both will be a hit for years to come. Remember the small things mom & make them count! It will be over before you know it! Wow! Sounds like you all had a fun week celebrating Dr. Seuss. I love the pancake idea. Reminds me of when me and my kids would cook 100 pancakes on the 100th day of school... hahaha we could never eat them all.